The Istanbul Metropolitan Municipality (İBB) Council approved Wednesday a plan to build approximately 50,000 residences in Esenler district on the few remaining large slots of land near the city center, which was handed over by the Ministry of Defense last year. Approximately the 8.7 million square meters-wide former military zone will be used as a reserved housing zone. The plan aims to resettle the inhabitants of Esenler , whose houses are in areas undergoing urban transformation, to the new residences. 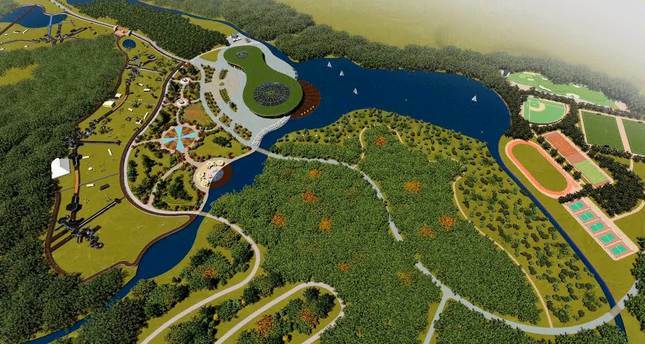 One of the world's largest city parks will be built in the area by the İBB, which will serve to a population of 3.5 million living in walking distance. In 2015, Prime Minister Ahmet Davutoğlu said that the park would be established over an area of 2.5 million square meters and that it would be the world's third largest. To implement the plan, a joint service protocol was signed between the İBB and Esenler Municipality. İBB can also use the reserved housing zones to resettle the inhabitants of buildings located on the routes of its new transportation plans in Esenler, Bağcılar, Bahçelievler, Güngören and Küçükçekmece districts. The İBB will be given 10 percent of the residences built by the Esenler Municipality, and it will be entitled to build its residence projects in the area through its social housing body KİPTAŞ and the government's social housing body TOKİ. The project foresees the demolition of 50,000 buildings in Esenler district, which saw rapid and unplanned urbanization starting from 1960's.